Your grill has been helping you provide great barbecue for your family and friends all summer. 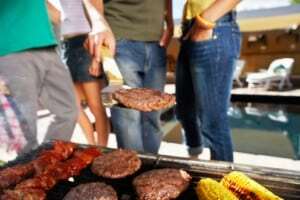 But now, you’re starting to notice a buildup of grease and grime on the inside and the outside of the grill. You may be dreading giving your grill the deep clean that you know it’s due, but if you follow these instructions, cleaning your grill won’t be so bad at all. 1. It will last longer. Like anything else, taking care of your grill is the best way to keep it working properly for years to come. If you go too long without cleaning, residue will remain to the point where it can no longer be restored quite like before. 2. It will cook food evenly. If your burners are clogged with grime and buildup, your food will not cook evenly. If you own a restaurant, this can mean that your customers’ dinners are not up to standards of taste and quality. It’s amazing what a difference a clean grill can make. 3. It will have fewer flare-ups. If you have frequent flare-ups of flames, the residue on your grill is often the culprit. You’ll see a lot less of that after a good, deep clean of your grill. 4. It will look better. If you’re having people over for a barbecue, the last thing you want is for them to see a grill that is gross and dirty. The key to having a sparkling clean grill is patience: there are many different elements to a grill and they will each need to be cleaned one by one. The work will be worth it when you see your grill looking like new again! 1. Find a time to clean your grill where you are not rushed: make sure you have plenty of daylight left, that the weather is tolerable, and that you have extra time to take breaks if you need to. Give yourself at least a couple of hours. 2. Make sure that you are cleaning in a well-ventilated area. It is strongly recommended to clean your grill outdoors because the fumes of the cleaning products can be toxic. 3. Before beginning any cleaning, make sure that your grill is in the “off” position and that it is completely disconnected from the propane tank. 4. You’ll need a good pair of work gloves to help protect your hands during this cleaning job. A good choice might be neoprene gloves. 5. Remove the grates from the grill and let them soak in warm soapy water. This solution can be made using warm water and a little bit of dish soap. Set that aside for now. 6. Using the soft side of a sponge and a small bucket of warm soapy water, wipe down the exterior of the grill. There is probably a lot of grime, water spots, and smudges built up from use. 7. For tough-to-remove spots, use a food-safe degreaser to spot clean. Worldwide Janitor has an oven and grill cleaner that’s perfect for this task. 8. Don’t forget the knobs and handles! Just think of how much grease, grime, and bacteria have accumulated on these portions of the grill over several months of use. After cleaning the outside of the grill, you’ll already start to notice a drastic difference. 9. Now it’s time to venture into the inside of the grill. But before you do, make sure to cover all heating mechanisms with tin foil to protect them from cleaning products, water, and falling debris. 10. Choose the right grill brush for your grill type. If you have a cast iron grill, you’ll need a wire barbecue brush, which is best identified by looking for the brush with gold bristles. If you have a stainless steel or porcelain-coated grill, you’ll need a stainless steel wire brush, which has silver bristles. 11. Use your grill brush along with a grill cleaner to start scrubbing the grates and the interior of the grill. Some good cleaners are the Snee Chemical Company’s oven, grill, & fry cleaner or the Chase Company’s oven and grill cleaner. 12. Next, clean the flavor bars using your grill cleaner and brush. 13. Scrub the bottom of the cookbox. You’ll likely be removing lots of fallen food. Your grill cleaner will help break up stuck-on grease and debris. 14. Empty the grease tray. Never use tin foil in the grease tray to try and reduce mess. It is a fire hazard. 15. Give the grates and all removable portions of the grill a good rinse with the hose. Leave them out to air dry before replacing them inside the grill. For internal components of the grill, it might be easier to rinse using a non-soapy sponge. 16. Finally, remove all tin foil that you used to protect some of the grill’s mechanisms. That’s it! You’ve paid back your trusty grill for all the great food you’ve been able to enjoy over the last several months. As a result, your grill will last longer and continue to be a fixture in your family meals and get togethers for years to come. This entry was posted in Degreasers, General Cleaning and tagged & Fry Cleaner, grill, Neoprene Gloves, oven, Oven and Gril Cleaner, superior dishwash soap. Bookmark the permalink.